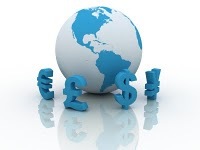 The forex market is one of the most dynamic markets on the planet. Unfortuatelly 95% of the traders loose their money. This is mainly because they don't have good tested trading strategy. On the other hand having a strategy, means that you have clear rules about every market situation. 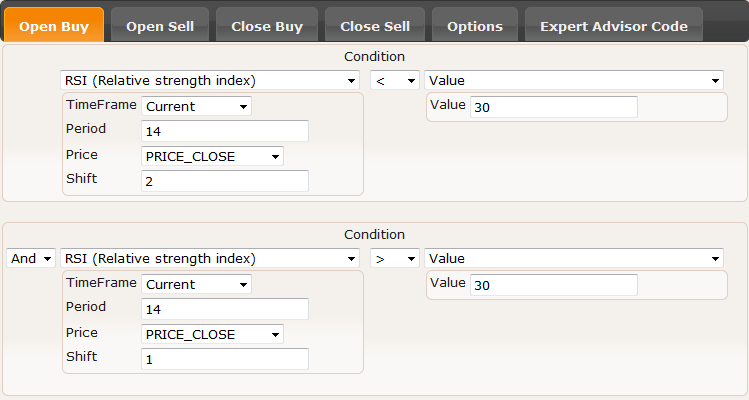 And when the rules are clear this trading system can be automated. There are many advantages for the automated systems like - 24 hours trading, reaction speed,monitoring huge numbers of financial instruments in different timeframes, the ability to backtest the system and many others. Automating a trading system is difficult because it requires program skills which most of the traders don't have. With this Expert Advisor builder such skills are no longer needed. When to open long position? When to close long position? When to open short position? When to close short position? We open long position when Rsi (Relative Strength Index) crosses 30. We open short position when Rsi (Relative Strength Index) crosses 70. We don't have exit rules , we have 50 points of StopLoss and 50 points of Takeprofit. This basically means this if the pre previous value of RSI is less than 30 and previous bar is closed with value for RSI over 30 , we have our open long condition. 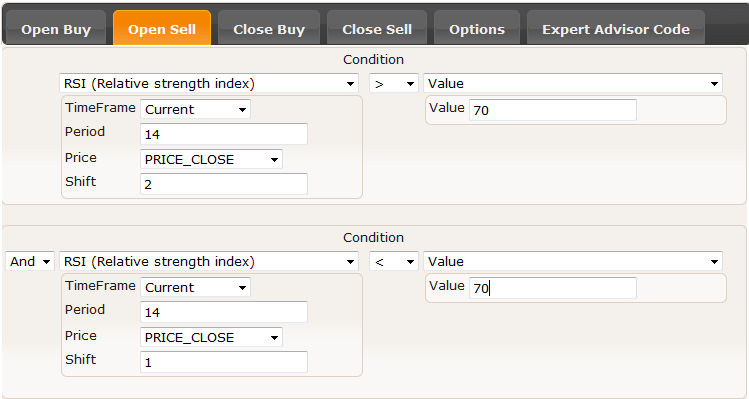 We skip Close buy and Close Sell and go directly to Settings tab. We set StopLoss 50 points and TakeProfit 50 points. We want advanced MM so we check that option. Now we go to the last tab and press the Generate button. Now all we need is to copy the code and paste it in the MQL Editor, compile it and start using it.